Do not miss this beautiful used 88' Sunseeker yacht for sale! : Atlantic Yacht & Ship, Inc.
Do not miss this beautiful used 88′ Sunseeker yacht for sale! This beautiful used 88′ Sunseeker yacht is now offered for sale by Stephen Faraldo. This 88′ Sunseeker is known as “Velocity” and is a 2010 88 Yacht model that is truly better than new. After all, her meticulous owner fitted her with all of the right options and upgrades. She boasts a four stateroom/ five head layout which includes a day head plus crew quarters for four. Furthermore, there are Pullman berths in 2 of the guest staterooms. In fact, arrange a visit aboard and prepare to be impressed! This used 88′ Sunseeker yacht is the epitome of style and a leader in performance. This beautiful used 88′ Sunseeker Yacht was tailor made for fun. Your own private playground, up to eight guests can relax, dine and unwind in the sumptuous surroundings, both inside and out. The fly bridge and fore-deck are topped with sun pads and comfortable seating areas – the perfect vantage point when you’re cruising along the coastline. Inside, the main saloon is as grand as it is vast with fine furnishings and precision craftsmanship clear for all to see. Below deck, the guest cabins and stateroom are impressively spacious and impeccably styled. Awe-inspiring on every level, the 88′ Sunseeker Yacht displays the true spirit of Sunseeker. For more information contact Stephen Faraldo today! 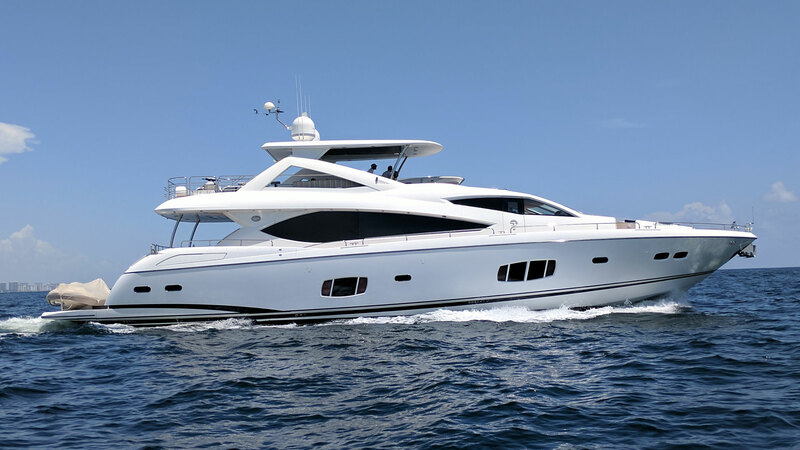 Don’t miss this beautiful used 88′ Sunseeker yacht for sale in Florida! Just listed: a beautiful used 2010 80′ Sunseeker yacht for sale in Florida! Don’t miss this beautiful used 80′ Sunseeker yacht for sale in Florida!